Left to right: Curt Seter, Hospice of the Red River Valley; Maralee Pinkney; Rita Rueckert; Ann Henne; and Jessica Pinkney. 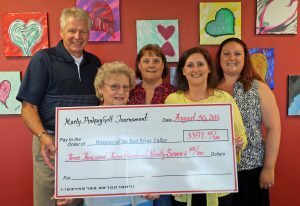 The 2nd Annual Marty Pinkney Memorial Golf Tournament was held June 17 at the Hawley Golf and Country Club and raised $3,397.55 for Hospice of the Red River Valley. Fourteen four-person teams participated in the tournament this year. Marty Pinkney passed away under the care of Hospice of the Red River Valley in 2014. The event is held in his memory by his family and friends.